The series of social dialogues in Brighton, England kicked off with a lively discussion on social media and online behaviours. The dialogues are 45 minute discussions amongst young people exploring the themes, relating to the digital society, that were identified as of importance to children and young people through a series of questionnaires with different stakeholders. Partners for Youth Empowerment Facilitator Gani Naylor used an ice breaker game ‘All change if…’ to activate the group and loosen everyone up. He also used short videos to provide some starting points for conversation. The eight 14-15 year olds taking part were highly engaged in the topics. They had a lot to say, but also listened to each other and the teachers. 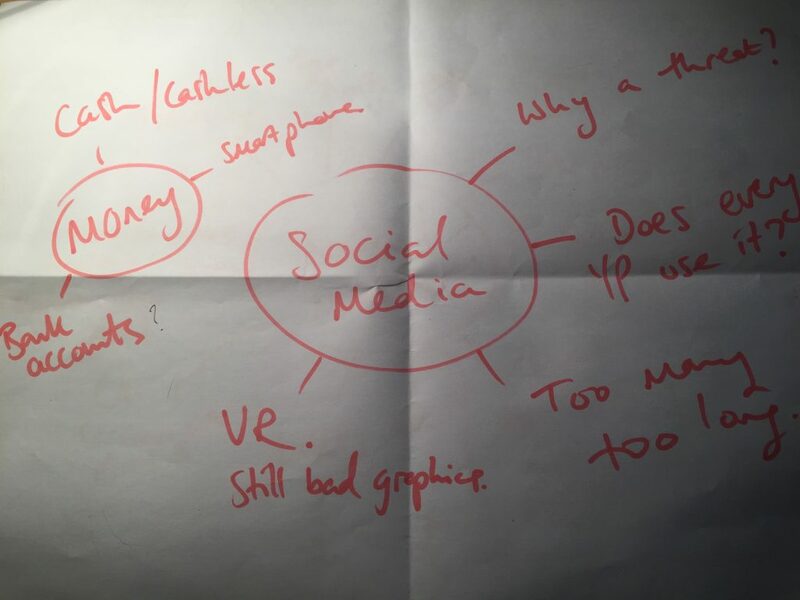 Social Media: Why is a social media considered a threat? Does every young person use it? There’s too many. Takes too long. Virtual Reality: Graphics are still not very good. Many haven’t used. Money: Do young people have bank accounts? How do we use cash vs card/contactless payments. Shorter School Hours: Some schools start an hour later. Cyber bullying: People using multiple accounts to pester. Some people don’t understand why people care about what others say.